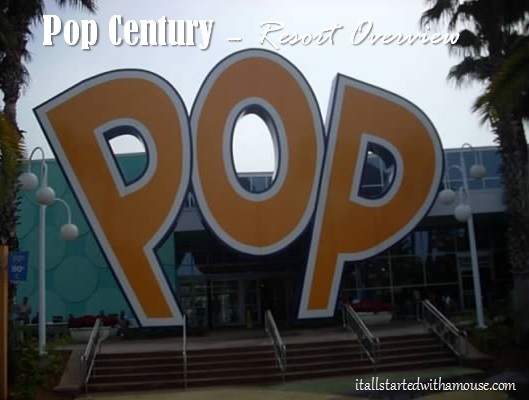 Disney’s Pop Century Resort is a fun celebration of yester-year, commemorating the 1950’s through the 1990’s. Located near ESPN Wide World of Sports, the Pop Century is the largest resort at Walt Disney World boasting 2,880 guest rooms. Tip: This is one of the resorts where you may want to think about upgrading to a preferred room, unless you don’t mind walking. Having a preferred room will put you closer to the main building which houses the lobby, food court, gift shop, and the bus station. If you are staying at the Pop Century (or even if you’re not) be sure to walk around the resort and check out all the neat things represented from the different decades. Bowling pins, Rubik’s Cubes, a Big Wheel, and so much more! Standard rooms have either 2 double beds or 1 king bed. Cribs are available upon request. Rooms come equipped with a safe, TV, mini-fridge, iron and ironing board, hairdryer, and free wi-fi. Laundry facilities are located near the 3 pools.